Some of the war room members pointed out the EURCAD today which we’ve been waiting for a sell signal to appear on. 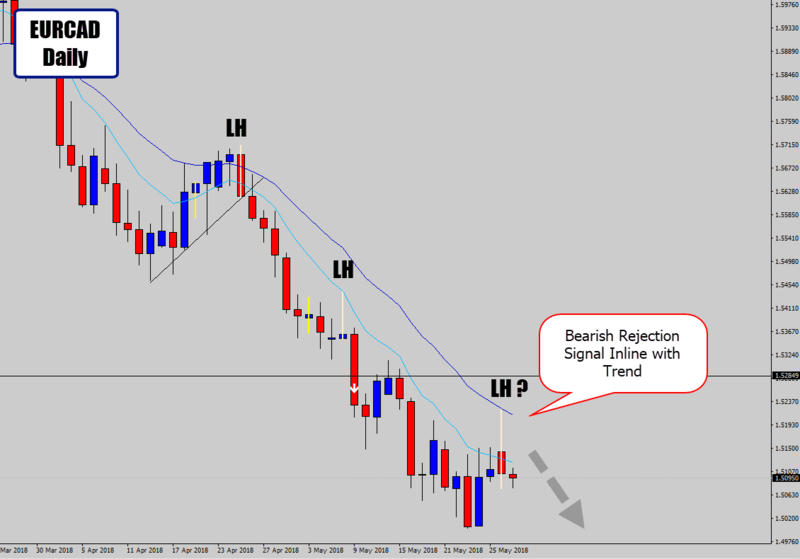 Previously I caught the bearish flag breakout, but now there is another opportunity to get short within the trend – thanks to last session’s bearish event. The daily chart printed a large bearish rejection candle, communicating rejection of lower prices, and likely continuation of downward pressure. If we look back in this trend’s history, we can see the bearish signals that have formed off a lower high had good follow through. EURCAD recently broke through a weekly support level, so we have a lot of downside potential for trade reward before the next major weekly support it is. Looking for a retracement entry this Asia session. Because we’re dealing with the CAD, this trade might not “light up” until the US session opens. I trad real account. But i always lose. Say if I want to enter on the 4hr do you still mark up on the weekly and add more on the daily then trade the 4hr or just mark the weekly?